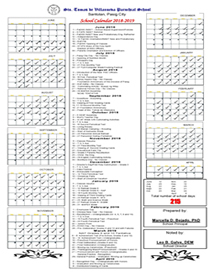 Last April 28, 2015, at 6:30 p.m., Dr. Sonia B. Sanchez, the newly appointed School Principal of Sto. Tomas de Villanueva Parochial School, held a meeting with some alumni to discuss “Kwentuhan with Batchmates” alumni gathering set on May 23, 2015. The meeting was attended by Ms. Majieneth A. Eugenio, Mr. Paul Andre Pascual, Ms. Leilani S. Ducusin, Mr. Jerome Allan M. Ducusin, Ms. Myra C. Samson and Ms. Marilen C. Reyes. Dr. Leo B. Galve, School Director, welcomed the attendees and introduced to them Dr. Sanchez. He first led the opening prayer and the short discussion on the objectives of the said meeting. Among those that were discussed include the creation of an Official Facebook Account, Trapaulins for information campaigns, and a Motorcade on May 17, 2015 at 8:00 a.m. The school believes that the alumni take a big part in the celebration of the Golden Anniversary of their Alma Mater comes September 17, 2016. The meeting ended at 8:00 p.m. with Dr. Sonia Sanchez leading the Closing Prayer. For more details, please call 646-1029. STVPS hosted the Operation Libreng Tuli and Alis Kuto to young children of Santolan last April 23, 2015. Mrs. Ellen Francisco Sityar, POWER Coordinator of Brgy. Santolan and wife of City Councilor of Pasig Willy Sityar, organized the said event utilizing the facilities of the Parochial School. Dr. Leo Galve, School Director, and Dr. Sonia Sanchez, School Principal, approved of the proposal to use three classrooms to serve as clinics for the circumcision of young boys and for the hair treatment of young girls. As early as 6:30 in the morning, these children lined-up the waiting area to register and be the first to avail of the services. Medicines and Vitamins for young children were also provided. City Mayor Maribel Eusebio went to the school to ex press her support. The Operation Libreng Tuli and Alis Kuto were sponsored by Mayor Maribel and Former Mayor Bobby Eusebio, Coun. Ricky Eusebio, Coun. Willy Sityar, Pasig City Health Office headed by Dr. Galutera and the tireless officers and leaders of POWER and PHA. The school is grateful to host this noble event and is looking forward to more possibilities of serving the community in its humble capacity. The Private Educ ation Assistance Committee (PEAC), Trustee of the Fund for Assistance to Private Education (FAPE) held a Certifiers’ Training for Educational Service Contracting (ESC) participating schools at Hotel Benilde, Malate, Manila last April 10, 2015. Dr. Leo B. Galve, the new School Director of Sto. Tomas de Villanueva Parochial School, was invited to attend the training together with other school heads and administrators all over Luzon. The training includes the orientation about PEAC by Ms. Doris Ferrer, Executive Director of PEAC Secretariat; Government Assistance for Students and Teachers of Private Education (GASTPE) guidelines for School Year 2015-2016 by Mr. Gabriel S. Dela Paz, Director for Investments; Certification Process and the Role of Certifiers by Ms. Norma Aguilos, Consultant, Certification Unit, and the Workshop. The main objectives of the training are to equip certifiers ample knowledge in determining whether an ESC participating Junior High School must have fully complied with the minimum standards for secondary education set by the Department of Education (DepED) and must have possessed an observable commitment to become an effective institution in delivering quality education programs and services. With the hope of providing a conducive learning environment, the school administration, with the approval of the Board of Trustees executed the repainting of the internal structures of offices, laboratories and classrooms of preschool, grade school and high school. The repainting started last March 23, 2015 and is underway to completion on April 10, 2015. DepEd Approves STVPS Senior High School! Sto. Toma s de Villanueva Parochial School’s application to offer Senior High School in school year 2016-2017 has been approved. In a letter from the Department of Education Senior High School – National Task Force dated March 31, 2015, Ms. Jocelyn DR Andaya, Chair, SHS-NTF, Director III, Officer-in-Charge, Bureau of Secondary Education advised the school to fully prepare the school and its facilities for 2016-2017 and also to advertise/market the SHS Program to attract prospective students. Sto. Tomas de Villanueva Parochial School plans to offer the Technical Vocational – Livelihood Track with Information Communication Technology Strand to focus on Computer Programming. Three from among the PaDSS member schools, namely Bicutan Parochial School, Escuela Catolica de San Sebastian and Sto. Tomas de Villanueva Parochial School are to prepare for the ocular inspection set by the Regional Office from June to October 2015 to validate the school’s readiness to offer the SHS Program. We are hoping that the school becomes effective in being the DepEd’s partner in the implementation of the K to 12 Program to provide every Filipino a decent and productive life through a quality and responsive system of education. Sto. Toma s de Villanueva Parochial School welcomes the new School Principal for the school year 2015-2016 succeeding Dr. Leo B. Galve who took office from 1999 to 2015. Dr. Sonia B. Sanchez, the sixth principal of Sto. Tomas de Villanueva, inked the appointment issued by the Board of Trustees headed by Most Rev. Mylo Hubert C. Vergara, Bishop of Pasig and Chairman of the Board; Rev. Fr. Orlando B. Cantillon, Vice Chairman, and the school director prior to the end of the school year; Rev. Fr. Orlindo F. Ordoña, Superintendent and Corporate Secretary; Rev. Fr. Hokan M. Samson, Dr. Leo B. Galve, and Mrs. Ruth G. Enriquez – members of the Board. The appointment takes effect on April 1, 2015. Tita Sonia, as her former colleagues fondly call her, hails from Sagad, Pa sig City. She earned her Bachelor’s Degree of Elementary Education and Master in Child Psychology at Philippine Normal College. She also completed her Doctorate in Administration and Supervision at National Teacher’s College. Dr. Sonia started her career as a classroom teacher at St. Paul Grade School Department, Pasig City for three years. She worked for twenty seven years at Pasig Catholic College as Classroom Teacher, Guidance Counselor, Guidance Coordinator and headed the Office of student Affairs. She also served Arellano University – Pasig for ten years as School Principal, Dean of College of Education, College professor and Admission Officer. Welcome to STVPS family Tita Sonia Sanchez. May you guide the school through its productivity and shall receive abundant blessings from the Lord through the intercession of Santo Tomas de Villanueva. Rev. Fr. Orlando B. Cantillon requested the school personnel to join the Eucharistic Celebration of Pope Francis at Quirino Grandstand last January 18, 2015. 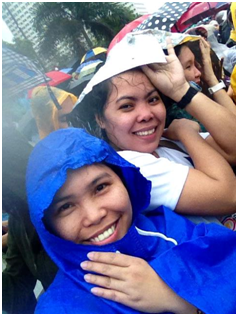 Twenty one school personnel took courage to conquer the rain and the cold just to have a glimpse of Pope Francis. As early as 9:30, the school personnel assembled at the school’s quadrangle. At ten o’clock, they boarded two private vans, left the school treading C5, EDSA, and Roxas Blvd. towards CCP finding ideal spot for parking. Despite continuous drizzle, these school personnel walked towards Luneta with the hope of finding a spot to hear the Eucharistic Celebration of Pope Francis. However, due to tremendous pilgrims flocking the streets, most of them decided to find the most available spot where the Pope was expected to pass by. Some were lucky to squeeze themselves through the crowd towards the barriers in the middle aisle, while others content themselves hanging on the fences. It was really a rewarding and awesome experience having the chance to see the Pope on his way towards Luneta and back. All colds, shivering, and other discomforts were gone after having a very short glimpse of the Holy Father. Thank you Ms. Rodylyn Meñoza, Ms. Gina Bagtas, Ms. Maria Imelda Balabat, Mr. Christian Santos, Mrs. Helen Aquino, Mrs. Susana Nahag, Ms. Maria Lucia Cruz, Ms. Norida Manginsay, Mrs. Maria Lourdes Solinap, Mrs. Ma. Nelia Tubelleza, Mrs. Ma. Shella Galve, Mrs. Glaiza Medina, Ms. Marvie Grace Tejada, Mrs. Elfreen Salinas, Ms. Rufina Abucot, Mrs. Alen Perez, Mr. Ron John Villaseñor, Mrs. Ethel Mae Cruz, Mrs. Ingrid Castillo, and Mrs. Ma. Nenette Rogel for braving the invitation. May God bless us and the school! "Wikang Filipino, Wika ng Pagkakaisa!"